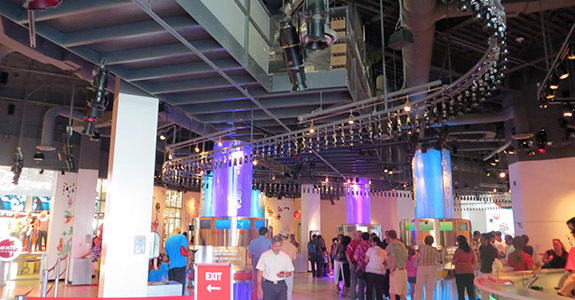 Atlanta is the world headquarters for Coca Cola and you simply cannot miss learning all you ever wanted to know about the world's most popular soft drink at The World of Coca Cola. The kids and I were so completely jazzed we just could not wait to get inside. Coca Cola has a special place in my heart. As a kid, there was not much that was more satisfying than an ice cold Coke, some french fries and a burger or pizza and that still holds true today (although I can rarely indulge in that kind of cuisine anymore, heck I might as well just paste it all onto my body because that's what I'd look like). Whenever I'd get sick as a kid or was just feeling run down, Coca Cola is what I'd crave. Sipping that indescribable bubbly flavor always made me feel better and on a hot day, there was nothing more refreshing. For me, and I am sure millions of folks around the world, Coke has inspired many happy memories. Located in Centennial Olympic Park, this unique attraction left us with and incredible one of a kind experience. Sure, it's a huge advertisement for Coke and they're not fooling anyone here, but Coca Cola is such a major part of American culture and so we couldn't wait to explore and learn more about it. It was so fun to see the evolution of their advertising throughout the years. There were so many things I recognized from my childhood and it was fun to tell my kids what I remembered. I especially loved the old commercials which instantly transported me back, flooding my brain with memories. Those jingles....I can still sing them today word for word. But there is so much more here besides just the advertising. We learned about the history of Coke, how it was developed as a headache reliever in the late 1800's by Dr. John Pemberton. As it became popular it was bought by businessman Asa Griggs Candler who became wildly successful. The recipe is a secret that is hidden in a vault on the premises which you can see-but not what's inside. 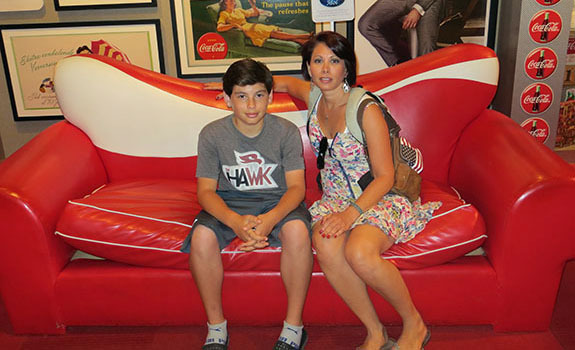 We sat at a mock soda fountain and then meandered through the history of coke through the ages eventually getting to sit in a red leather sofa used in the green room on the American Idol set. Lots of celebs sat there tush right there on that sofa and you can too when you have a seat like we did. 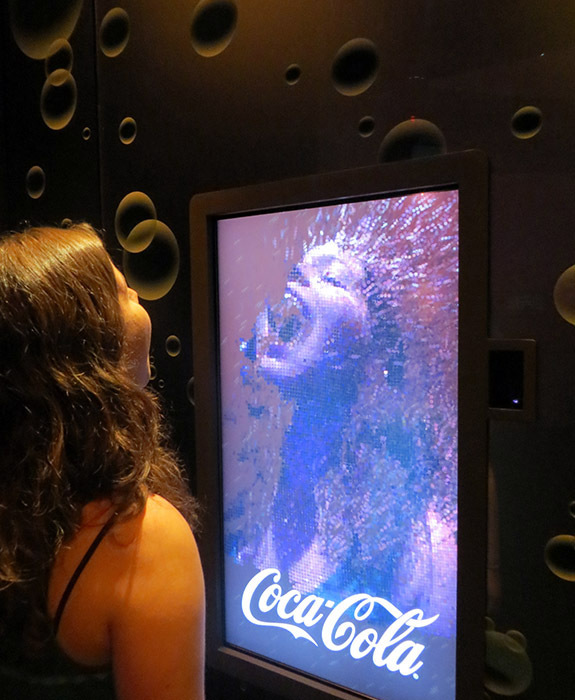 There are lots of other interesting and artful "exhibits" like the decorated larger than life size bottles of Coke and the bubbler video display. You can stand in front of it and have yourself "bubbled". It's a totally cool effect and makes for some pretty awesome pictures. Finally we arrived in the tasting room where you can sample all the Coca Cola products from around the world (most of which you’ve probably never heard of). Some were really tasty, and some just awful, but we had a fantastic time sampling away and comparing tastes from around the globe. It's really interesting comparing what populations consider tasty and how tastes vary by continent. As we were experiencing the ultimate caffeinated sugar rush, we noticed a stream of Coca Cola bottles overhead that were bottled on site. 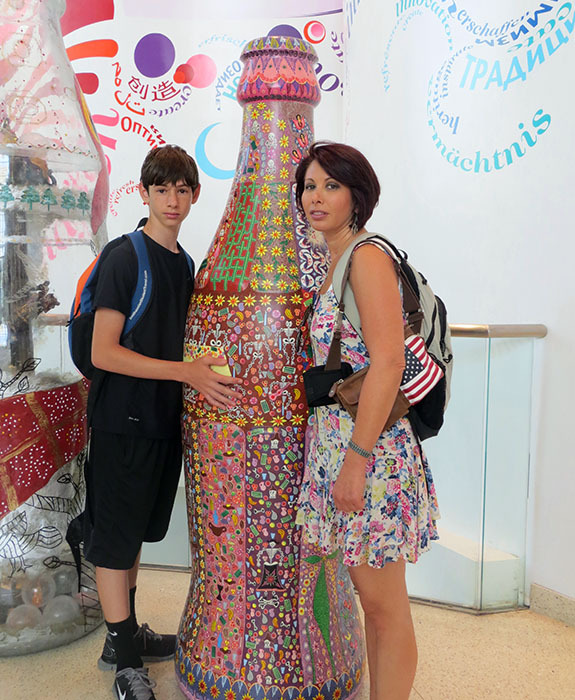 As we were getting ready to exit into the enormous Coca Cola gift shop we were each handed one of those little bottles as a souvenir. A word of caution—if you don’t drink your souvenir before you get to the airport (if you are flying) make sure to put it into your carry on. I forgot and had it confiscated at the airport…I so sad I thought I was going to cry!!! The gift shop, which is more of an emporium, is chock full of everything you can imagine emblazoned with the Coca Cola logo. I got a Coca Cola cookbook which I can't wait to try out. We got the requisite t-shirts and sweatshirts and a few other souvenirs and had them all sent home. This is a DO NOT MISS for everyone because let's face it...Coca Cola is an all American product that is recognized and loved around the world. It's also a cultural icon that is as American as apple pie and Uncle Sam. We enjoyed going around as a family and each picking our most and least favorites at each stand. Didn’t one stand out as being esp. terrible to you and your family? We still talk about the one terrible one. I think if I remember correctly there is even a magnet about it in the gift shop? omg!!!! 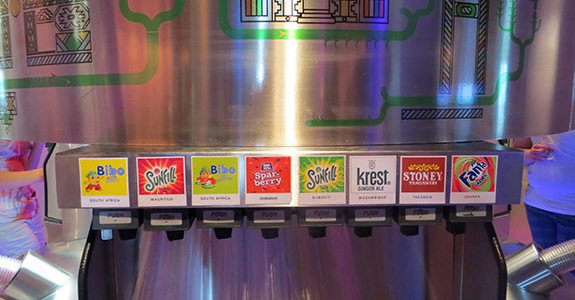 Yes, there was one that was just HORRID….Ugh…I can’t remember the name I think it was Stoney but I can’t remember. Which one is it??? ?